The reason why the pope did not use the staff resides in the fact that the staff was a symbol of investiture of a newly elected bishop given to him by the metropolitan archbishop or by another bishop (a ceremony which from the Carolingian period until the time of the investiture controversy was conducted increasingly by secular rulers). The pope, however, did not receive investiture from another bishop, as Bernardo Botono of Parma (d. 1263) pointed out in his Glossa Ordinaria dei Decretali di Gregorio IX (“The Ordinary Glosses of the Decrees of Gregory IX,” 15): The pope receives his power from God alone. Saint Thomas Aquinas offers a further reason, when he comments that: “The Roman Pontiff does not use the staff . . . since it is a sign of limited power, which the curvature of the staff signifies” (Super Sent., lib. 4 d. 24 q. 3 a. 3 ad 8). Here, Saint Thomas refers to the form of the staff hitherto commonplace that was twisted at the top, as a sign of pastoral care and jurisdiction. From the High Middle Ages, if not even before, the popes used a pontifical staff as insignia to signify their temporal power. The precise form of the staff is not well known. It probably was a stick with a cross at the top. In the Middle Ages, after the pope was elected and took possession of the Lateran Basilica, he was presented with the staff by the Prior of Saint Lawrence at the Lateran (that is, the “Holy of Holies”) as a “signum regiminis et correctionis,” that is, as a symbol of his governance that included the power to mete out punishment and impose penances. 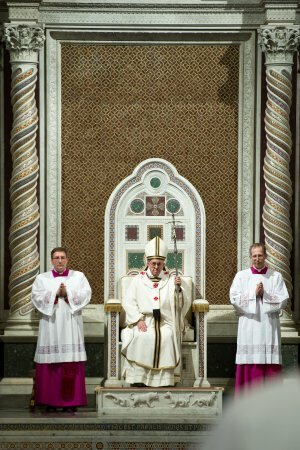 The presentation of the staff was an important act, but did not have the same significance as the imposition of the pallium which took place during the papal coronation ceremony. In fact, it was no longer observed from the beginning of the fifteenth century. The use of the staff was never a part of the papal liturgy, except on some occasions such as the opening of the Holy Door and the consecration of churches, during which the pope took hold of the staff to knock on the door three times and to trace the Greek and Latin letters on the floor of the church. 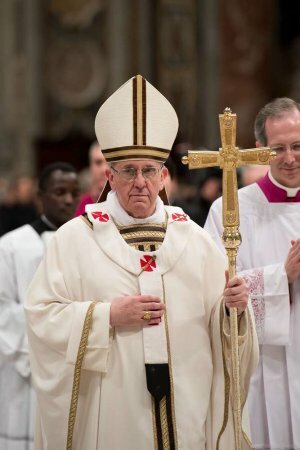 In the late Middle Ages, the popes also used as a staff a crozier with a triple cross. After Pope Paul VI’s election in 1963, he commissioned a Neopolitan sculptor by the name of Lello Scorzelli to design a pastoral staff to be used during solemn liturgical celebrations. This silver crozier went back to the traditional type of staff that took the form of a cross, accompanied however by the corpus of the Crucified One. Paul VI used this crozier for the first time for the closing of the Second Vatican Council, on 8 December 1965. Afterwards, he used this crozier – often but not always in liturgical celebrations – as any bishop makes of his crozier. On certain occasions, Paul VI and John Paul II also used the triple cross as insignia. On Palm Sunday 2008, Pope Benedict XVI substituted this staff, used also by Pope John Paul I, Pope John Paul II, and by himself, with a staff surmounted by a gold cross, that had been given as a gift to Blessed Pope Pius IX in 1877, by the Circolo San Pietro, on the occasion of the fiftieth anniversary of his episcopal consecration. This crozier had already been used by Blessed Pope John XXIII for various liturgical celebrations during Vatican II. 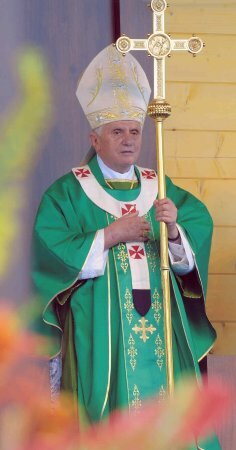 With the celebration of First Vespers for Advent 2009, the Holy Father, Benedict XVI, began to use a new staff, given to him by the Circolo San Pietro, similar in style to that of Pius IX. (1) It should be noted that while Italian has several names for this liturgical object, each carrying a particular nuance, this variety is not generally available in English. Thus, “crozier” and “pastoral staff” are used interchangeably.